In a history spanning over a century, Royal County Down has established a mighty reputation, and is now widely regarded as the world's second best course. Includes entry into 3 day tournament, welcome drink and gala dinner! Playing rounds at: Royal Country Down, Ardglass Golf Club and Spa Golf Club! 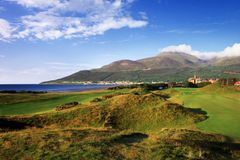 Set against the backdrop of the spellbinding Mountains of Mourne, the links land at Royal County Down seems heaven sent for golf, and there are few more incredible places to enjoy a game. The layout was devised by Old Tom Morris, whose name will forever be inextricably linked to St Andrews, and is a pure test of links golf. Most recently used for the Irish Open in 2015, Royal County Down is etched in the list of the most desirable courses anywhere in the world, and has garnered praise from the loftiest of golf's stars; Open Championship legend and links golf master, Tom Watson, said: "It is a tremendous test of golf and the outward half especially is as fine a nine holes as I have ever played." Did you know? Peter Alliss said of the course- 'The best prepared links that I have ever seen'. Spanning the same turf as the hallowed championship course is the Annesley Links. Royal County Down's second layout is just as spectacular, but is not as challenging - the Annesley is very much a course to be enjoyed by everyone. Packed full of character, the Annesley is the perfect complement to the main event. The 9th hole on the Championship course is one of the most photographed holes in golf. From the tee, you are greeted with spectacular panoramic views and beyond the line of the hole lies the magnificent Slieve Donard Peak. However, while beautiful, the 9th also stands the test as a challenging and thought provoking golf hole. The long par 4 starts with a blind tee shot to a fairway guarded by densely covered dunes either side. From there, it is important to hit the small green on the approach, since bunkers front, right and left mean that any miss could lead to trouble. The undulating green provides a great finish to a hole which will satisfy even the most demanding of golfers, both through its beauty and the challenge it presents!